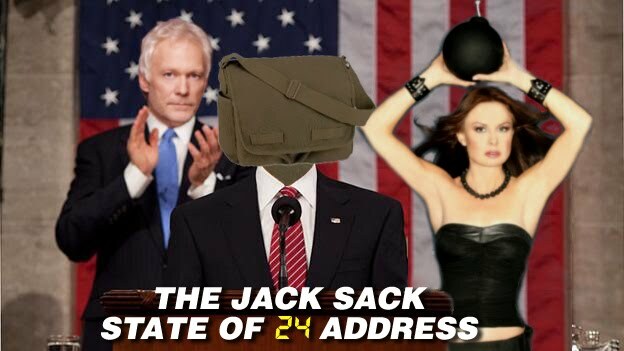 The Jack Sack™: The State of "24": Season 8 Spoilers & Speculation Too! The State of "24": Season 8 Spoilers & Speculation Too! Madame Senior Intelligence Analyst, The Jack Sack of "24!" My fellow "24" fans, I come before you today on the eve of the 12th episode of Season 8. We have met many new characters, we've delved into some ridiculous subplots and we even have a new leather manpurse that costs nearly $900 retail. While we face many challenges in the coming episodes, I stand before you today very optimistic that this season will redeem itself. The State of "24" is not ideal, but its future is strong! Now, I can go on about the problems- how Cole Ortiz has a terrible NY accent, how Arlo Glass is one margarita away from ending up on Datline's "To Catch a Predator," how Brian Hastings has limited range of motion from the neck up or how Dana Walsh/Jenny is the most ridiculous human being to ever occupy space in our television sets. Indeed, these have been challenging weeks in which many of you have come to me and stated your deep displeasure with the new CTU. I agree with your concerns, but I am here to tell you that things are going to get better. No, I'm not hopeful they'll improve, I am absolutely sure that Season 8 is about to explode your weary brains. Perhaps we should think of this show as "13" as there are that many episodes left. In 13 episodes we will meet new villains, we will be reunited with Former President Charles Logan, and most importantly we will continue to have a fully armed and operational Jack Bauer slaying bad guys (and girls). Ever since Jack moved his manpurse shoulder strap over his head to his opposite shoulder, he has become the one-man militia that we all embraced many seasons ago. Last night's episode was further proof of Jack's resurgence ("LOOK INTO MY EYES!") and he has had enough of these amateurs at the new CTU. Remember, Jack has watched these episodes along with us, and he is pissed off. Now, I have been more critical than most about the first 11 episodes. I can count this season's great moments on maybe 2 or 3 fingers to be honest. Everything else has been either average or downright frustrating. Renee Walker started out as a full-blown badass but quickly dropped all toughness once she got into the room with a lawyer from the Department of Justice. While the women's movement may have been set back several years, I remind you all that she still knows how to fire a gun. I will auction off one of my vital organs if she does not prove to us her valor with weapons by season's end. Can the show redeem itself despite these problems? A week ago, I would have said probably not. And even through last night's frustrating episode, I found signs of hope-- CTU Director Brian Hastings has become a worthy leader, trusting Jack Bauer at every important moment and even promoting Chloe O'Brian to her rightful place as CTU's boss of techie stuff. And Hastings is not a pushover either- giving Ortiz and Walsh a proper dressing-down that we've all been waiting to see happen. With Hastings and Jack working in sync, we've hopefully overcome the inevitable frustrations that come with Bauer clashing with authority figures every single season. Sure, they'll have disagreements again, but they will concern whether Jack should use his fist or a knife when interrogating a terrorist. Click here to have your mind ruined by spoilerific revelations! The big spoiler: I predict that next week we will learn that Dana/Jenny was a mole all along. The whole redneck plot was meant to diminish Jenny-- to make her appear weak, incompetent and annoying, and to also minimize our expectation that she's dangerous. A lot of us have asked "How could she have cleared a background check to get a high-security job at CTU?" Well, she had help, my good people. She had help from powerful allies who obviously have some access & influence in our national security system. Yes, it's a well-worn twist in 24-land, but at least it explains away the idiocy of her character. And she will likely be the link to whomever is behind the bigger plot that we have yet to know. And that's where the speculation begins: who's behind Jenny? The guys trying to take over Kamistan from President Hassan? Not likely. 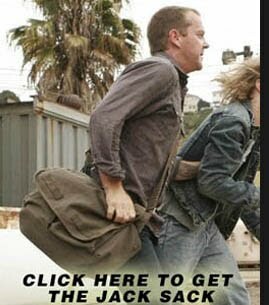 This is "24"- they insist on adding new layers of villainy to every plot. Last season we got a double-decker of intrigue with Jonas Hodges being the first beef patty of badness and Alan Wilson being the next. So, it will likely be the same with Season 8- and there's one character that I'm hoping will figure large in this game- Former President Charles Logan. Chuck was last seen in Season 6 with a Henckel knife protruding from his upper body. While his fate has been unknown since, the show has publicly acknowledged that the character is coming back this year. He's my favorite "24" villain and he deserves another shot at taking on Jack & Co. Maybe he's not a villain this time around, you say? Maybe, but I don't think they're going to bring Logan back to rehabilitate his character. If they do, I'll be disappointed. I would rather see him exact revenge upon those whom he feels have wronged him. "Revenge! Now we're cooking!" But either way, there's that extra layer of evil behind the nuclear rods and Jenny that we have to expect. Alan Wilson's fate has been hinted at in passing, and I expect either he or his organization have some involvement in this season's crisis. I will speculate no further, but I am very hopeful that things will become very interesting starting next week. I declare comments for this post a SPOILER zone. Therefore, if you've skipped the spoiler section, you're advised to not read the comments to this post. If you want to comment on this article without reading the spoilers, feel free to post your thoughts at the State of "24" Preview article here. In closing, let's tighten up our ranks- we have a half of a season of this show left and I refuse to give up hope on a more violent, dangerous future! God Bless 24! (Thunderous applause, The Jack Sack walks up the aisle and shakes straps with various purses and manbags). I hope the gods of TV heard you, it will be great !! Adam, I so hope you are right about Jenny having "help" getting into CTU. Her entire storyline is ridiculous unless what you have put forth is true. Perhaps the writers will read your spoilers and take heed. But the timeline is off and they might have to re-film something to catch up with you or to keep us from biting our tongues in two as we nod off. Why, why, why wait this many eps to do something interesting? Even if your Dana/Jennie scenario or something even more spectacular emerges, it won't matter. It's been too long and she's too dreadfully stupid for anything to make up for that. Has anyone mentioned that Prinze looks blood-drained like a vampire? Anyway, it's too late for Galactica girl. I don't care WHO got her in there -- even if it's Chuck (and I'd like to see some "getting even" from him) (Hey, maybe he'll wear a cake on HIS head). Hope things improve. I really thing more Jack snapping necks and other Jack-feats would help matters. Haven't they figured out yet that characters who have no direct relationship with Jack are boring as hell? Who cares? Long live Jack-violence. Amen. @PJ- I love the imagery you put forth about biting your tongue in boredom! Such a beautifully visceral notion. I went back to read some stuff I wrote while Season 6 was airing, and I found myself doing the same thing I'm doing now- posing ideas that could somehow rescue frustrating subplots and characters (Josh Bauer, Jack's nephew, come on!). But I fear the cycle is repeating itself here. I am hopeful, but a small part of me is fully expecting to be disappointed by what they offer. But hope is the word of the day! @RB- I own your retinas. That's a good point about Anil's accent. I had not considered that yet, but he is definitely messing with his voice. I was too distracted by his awesome hair, I barely register what he's saying half the time. But seriously, that's nice hair. Can I pull off that look?